The other day my daughter asked me, "Mommy, when is Clover Day?" St. Patrick's Day is coming up in a few weeks, and it sounds like we have a little explaining to do when it comes to that holiday. 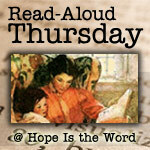 To start off, this week we focused on clovers and shamrocks. Why are shamrocks associated with St. Patrick's Day? After some research we discovered that, according to legend, St. Patrick used the three-leaf clover to explain the Trinity - The Father, The Son and The Holy Spirit. "S is for Shamrock ... Try to find one. If you do, Irish luck will come to you." "When new grass grows in the sunny meadow, what do rabbits do? Hop all over in the clover." Inspired by the pictures of bunnies eating clover in Spring Song, we made our own clover patch out of pipe cleaners and some playdough. The kids each made their own brown rabbit. We cut out rabbit shapes from brown construction paper, they used crayons to color parts of the rabbits white and pink, and then we attached cotton ball tails and googly eyes. 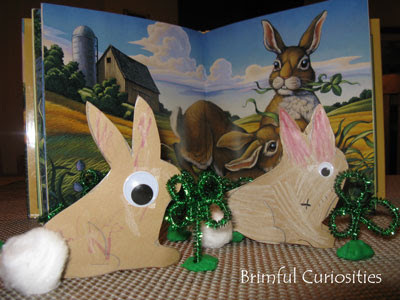 We wanted to rabbits to stand up by themselves, so I cut out strips of paper, taped them in circles and stapled to the back of each rabbit. 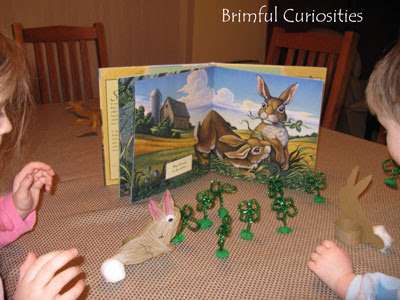 We had fun pretending the rabbits were eating the clover field using the book as the backdrop. That is a terrific story stretcher! My word- that is just simply adorable! I am also gonna check to see if I can find these stories at our library for our "Leapin' Leprechauns" week unit- thanks for the info! Oh my gosh, I love this project. It is too cute! Well, I've learned something! I didn't know Eve Bunting was born in Ireland! Her book looks fantastic! I'm going to look for it tomorrow at the library. I LOVE what you did to extend the bunny book. It looks beautiful. It also looks like everyone had a great time! What a cute craft to go with a cute book. I've never heard of those books. Spring Song sounds adorable! I've thought of framing pictures in books before. I love the bunnies in the clover patch craft. They are so cute! I thought that St. Pat's day was associated with clovers because they grew in Ireland. Cool, I learned something. And I love the pipe cleaner clovers...its an art project and a storytelling prop in one. I love your bunnies and clover - very lovely indeed! 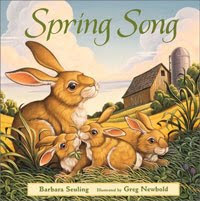 Oh wow that Spring Song sounds like a great book. I am going to see if I can get it just in time to bring my bunnies out for Spring, and Easter! Thanks for joining my linky! Wow - I love your pipecleaner shamrocks, and Spring Song sounds lovely. I had kind of the same experience with Sleeping Bear Press - the alphabet books are targeted to much older audience and way over the top for my daughter level.